Well, winter has finally come to Old Salt Farm. We’ve had a ton of snow, which is actually what we wanted, so we are so happy! Yesterday was cold and snowy, a lake effect snow warning was in place, and I knew my kids would be freezing when they got home from school. 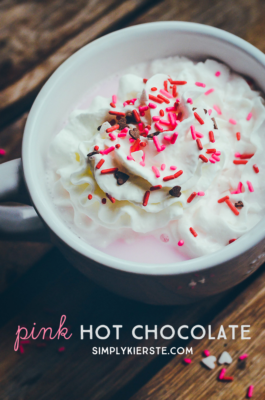 So I whipped up a pot of homemade hot chocolate, with a brand new flavor! Our family loves Reese’s Peanut Butter Cups. REALLY loves them. 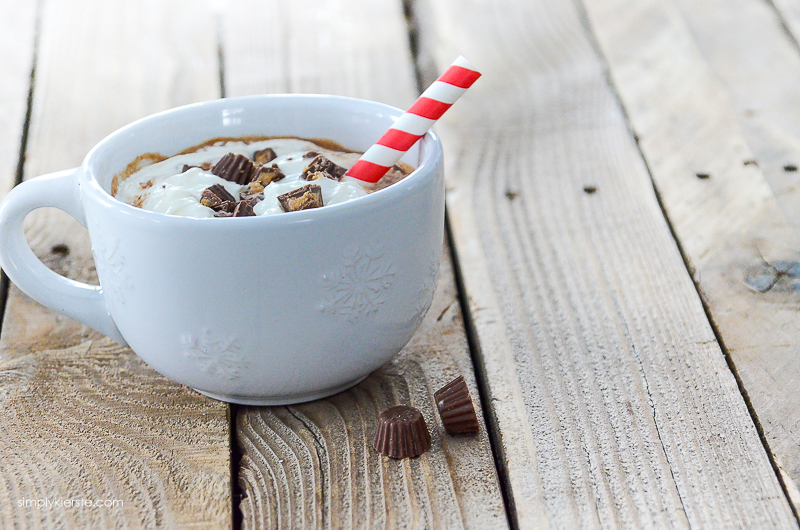 They’re the most requested candy for any holiday, and they’re our favorite for S’mores. 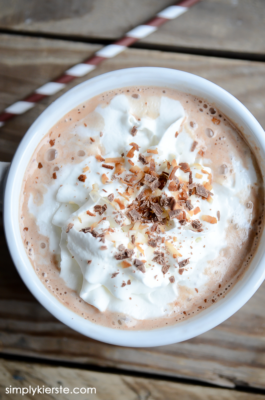 And hot chocolate? It’s a staple at our house during the winter months, so I took my homemade hot chocolate recipe and made it into Reese’s Peanut Butter Hot Chocolate! 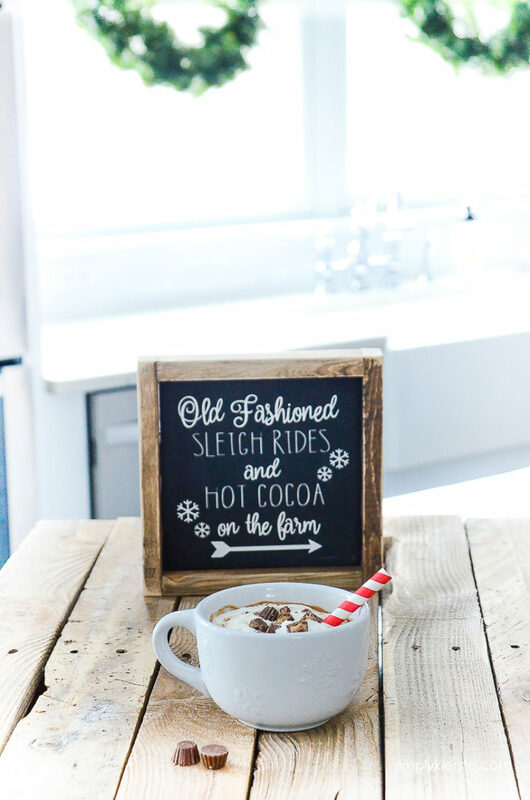 It was a huge hit with my kids, and it’s now been added to our favorites list. Best of all, it just takes a few minutes to whip up, so it’s easy to make anytime. The recipe calls for an even amount of peanut butter chips and chocolate chips, but this is where you can change things up if you want to–if you want to do a little more chocolate and a little less peanut butter, or vice versa, it’s easy to do! Melt the peanut butter chips and chocolate chips with the evaporated milk in a large saucepan. Use a whisk to smooth the mixture, then add the milk. Start with three cups, and add more slowly, as needed. 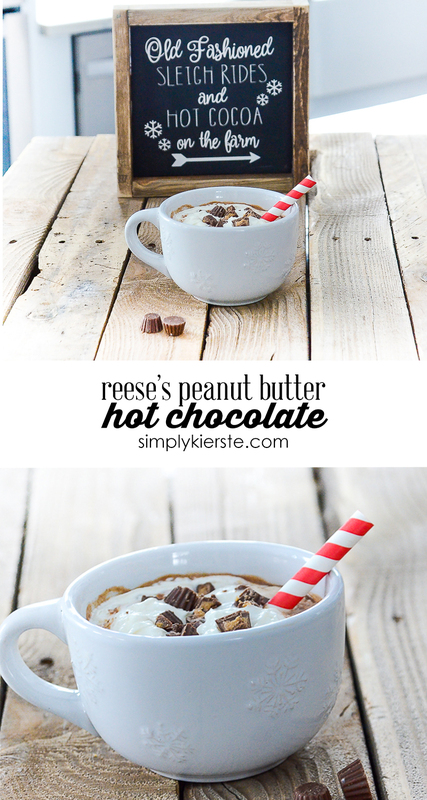 Heat through, then serve with whipped cream and chopped Reese's Peanut Butter Cups! Looks yummy! The sign with it is so cute too! Did you make it? I didn’t make this one—I got it from The Banner Girls on Etsy!! I felt the exact same way when I made it, lol!! Thank you for the recipe. . . .sounds absolutely delicious.